(CNN) It’s one thing to see the charred destruction that raging wildfires left this week in the eastern Tennessee resort town of Gatlinburg, but quite another to see it side by side with pictures of what those same areas once looked like. The set above shows businesses on either side of one of Gatlinburg’s main arteries. The “before” image was taken from Google Earth; the second was taken Tuesday by an Associated Press photographer from a National Guard helicopter. 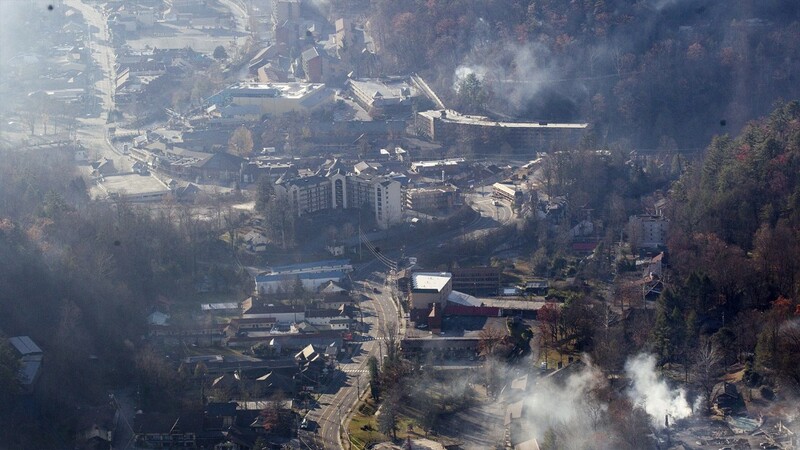 These photos show the Westgate Smoky Mountain Resort & Spa. The older image comes from Google Earth; the recent one was taken by the Knoxville News Sentinel on Tuesday and distributed through The Associated Press. Imaging satellites operated by Colorado-based DigitalGlobe took the set directly above, as well as the three below. The “before” pictures, all of the Gatlinburg area, were taken on January 17, 2015, and are shown in natural color. The “after” photos were taken Thursday, using near-infrared imagery. These kind of images, DigitalGlobe says, show healthy vegetation in red and burned areas in dark brown. The set above shows homes in the Gatlinburg area. Above is an area that includes Ripley’s Aquarium of the Smokies. The aquarium was not damaged, but many of the houses to the north were burned. Above offers a more distance view of the area.